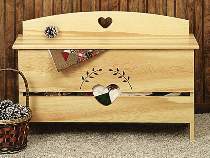 Pine bench is decorated with heart and wheat cutouts. Narrow design is perfect for hall, entryway or bedroom. Sturdy 11 inch hinged seat lifts to reveal valuable storage space for gloves, umbrellas, blankets or toys. 23"H x 36"W x 12-1/2"D.